There were a lot of great games released at Gen Con this year. 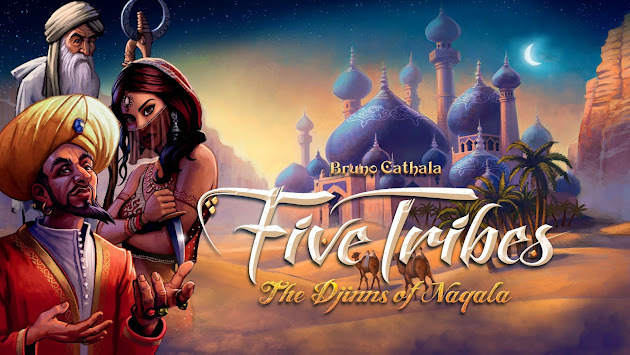 Five Tribes, from Days of Wonder and Bruno Cathala, was one of the most talked about - and hardest to get. Now that the game has finally hit distribution, does it live up to all that hype? No "board" but still takes up a lot of space! Looks good doing it, though. Five Tribes is a part logistics puzzle, part action selection, part point salad game that pits players against one another, each of them trying to best maneuver the five tribes of the "Land of 1001 Nights" in order to become the next Sultan! The game board is made up of 30 individual tiles, which are arranged randomly before each game. Meeples of 5 different colors are placed on these tiles, also randomly. Players will take turns picking up a group of meeples from any tile on the board, and dropping one off at a time, mancala-style, until they drop the last meeple they picked up. One important rule when choosing which tile to end up at - there must already be a meeple on the tile the player ends with that matches the color of the meeple she is placing on the tile. Days of Wonder has included some large, but superb player aids. Once the player finishes distributing the group of meeples she picked up, she performs two actions. First, she picks up all of the meeples on the tile she ended on that match the color of the meeple she placed there (always at least two because of the rule I mentioned above), and executes that tribe's action. If the player was able to pick up all of the meeples on a tile (because they were all the same color of the meeple she placed there) she gets to place one of her camels on the tile, and will score that tile's depicted points at the end of the game. Then, she also gets to perform the action of the tile she ended on. buy 2 goods cards for 6 gold. The actions of the tribes and the tiles are quite varied and give players the opportunity to score points in a variety of different ways. Some allow players to get money right away, which can be used in game, or exchanged 1:1 at the end of the game for points. Some allow players to acquire powerful Djinns which can grant either in-game or end-game bonuses. And others will allow players to go to the market, and attempt to assemble sets of goods card which can be traded in for large amounts of points/money. Gameplay continues until either one player places all of her camels or there are no legal moves left (no groups of meeples can be distributed in such a way that the final meeple to be placed will be the same color as one already on the destination tile). The biggest potential problem for Five Tribes is how many options players are presented with, all at once. Five Tribes is not a game that starts off at a reasonable pace, and then ramps up as the game progresses. For the most part, from when the game begins, the number of choices for the players is gradually decreasing, as more meeples are removed from the board, and more tiles become owned by players. That not only can make the game intimidating and difficult to learn for new players, but it can also lead to a lot of analysis paralysis for experienced players. This can lead to awful amounts of downtime for the rest of the table. This also, however, means that player turns are almost never boring, and each point earned by players really feels like the result of proper planning and execution. One of the most exciting parts of Five Tribes is something I haven't mentioned yet - bidding for turn order. Before each round, players will bid for turn order. There is a bidding track, like in Amun-Re or Vegas Showdown, where the values are fixed, and in turn order of the previous round, players place their bidding pawns on the amount of money they are willing to pay for turn order. This is interesting in itself and leads to a bit of bluffing and gamesmanship, but keep in mind also that at the end of the game, money is converted into points at a rate of 1:1. The main mechanism of Five Tribes, the manacala-esque distribution of meeples is so much fun and super satisfying. Players are challenged each turn to both get as many points as they can (hopefully more than they bid for their turn order) as well as keep from setting the other players up to either take ownership or a tile or otherwise have a huge turn. Five Tribes absolutely lives up to the hype that surrounded it during Gen Con. The game is a solid 9.0 in my book - one of my favorite releases this year. This post is not a review, but a preview of a game currently seeking funding on Kickstarter. Final art, rules, and components are subject to change. I don't think there's anything I love more than sitting around with my friends and family and laughing. That is why I love games like Taboo and Balderdash. They don't is not much to those games, but they produce such hilarious and memorable moments that I simply can't get enough of them. Knee Jerk is a game similar to those two in a way. Players need only a deck of cards and about 10 seconds of rules explanation in order to play. The game is dead simple - the active player (host) deals 2 cards to the table, and 3 to her hand. She chooses one from her hand, and lines it up with the other 2 so that the green arrow of the first card points to the blue arrow of the second card, which points to the orange block of the third card (the one she chose from her hand). This orientation of the cards will create a randomized story prompt. After the host player reads the story prompt, the rest of the players begin offering up their versions of how the scene ends. The host then awards the player who answered first a point - in the form of the left-most card on the table. Play then continues with the host placing another card to the right. Knee Jerk is so simple, but so much fun. The crux of the game, however, relies on the players you've gathered together. I think that the rules are simple enough that anyone thinking about bringing this out with a group would already have a pretty good idea of whether or not it would go over well. But because the rules are so simple, it is also fairly easy to implement variants. The game rules also suggest playing where the host awards the point for a story to the first answer given. While this rule certainly fosters a wide range of hilarious answers shouted out without thinking, I also think that having the host choose her favorite story for each round is also a lot of fun. The last game of Knee Jerk I played with a kind of a blend of the two, where the host of the round chose which rule variant she wanted to use. Knee Jerk is one of those party games that I love - it brings out a special kind of silliness in people that is just so much fun to be involved in. And just like the best party games, it is not only a blast to play, but it can also create discussions about where some of these ridiculous stories come from - either real or created. 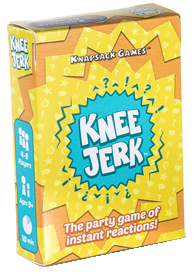 Knee Jerk is great party game - and an absolute steal at $10. If Knee Jerk sounds good to you - go back on Kickstarter now! Dead of Winter is the latest game from Plaid Hat Games. Despite not being a huge fan of any of Plaid Hat's games (except for Summoner Wars, which I love), I always get very excited about each of their releases. They always have really interesting themes mixed with neat twists on game mechanisms. Does Dead of Winter buck the trend of disappointment? Would I even ask such an obvious rhetorical question is the answer was "no?" Read on to find out! Dead of Winter is a semi-cooperative game that takes place after a zombie apocalypse has ravaged the world. Players take control of survivors in this world, struggling to live in this new world. The survivors need keep the hordes at bay and make sure the colony is safe and fed. In a round, players will roll their action dice. On their turn, players will spend their dice in order to take actions with their survivors. These actions are things like searching locations in order to gain resources or items, fighting zombies, or building barricades. The zombies will keep coming and bad things will keep happening to the colony, until either the survivors complete their shared objective, or the colony's morale falls to 0. Sounds simple enough, except that Plaid Hat and Mr. Gilmour and Mr. Vega have added quite a few interesting little twists and turns to make Dead of Winter quite a unique experience. First is the fact that although the group as a whole has a common objective, each player has a personal objective. Each player's personal objective states what the player needs to accomplish in order to win. These objectives most often have a bulleted list that includes the group completing the common main objective, but also some other conditions that must be met that will likely make the group's completion of the main objective more difficult. Even if the main objective is competed, players can only win if they also completed their individual objectives as well. The great thing about this system is that there are also betrayer objectives. These objectives require that the game end not because the main objective has been completed, but because the colony's morale has fallen to 0. The game also includes the option to exile players from the game if they are suspected of being a betrayer. This adds a lot of tension to the game, and keeps the players from devolving the game into a mess of "well Idecide on a 'm not going to win, so no one is going to win," which, in my opinion, has been the biggest issue with semi-cooperative games in the past. A huge source of tension in the game is the exposure die. It must be rolled every time a survivor either moves around town or fights a zombie. On about half of the sides is nothing - which is what you'll be hoping to see each time you roll that accursed die. On the other half are bad things, which cause either normal wounds, frostbite wounds, or even instant death. The fact that players can lose a survivor with a single roll of the die is a lot of fun. The last twist in the game is the deck of Crossroads cards. At the start of each player's turn, the player to the right of her draws a Crossroads card, and reads the it. Each Crossroads card has a condition on it, which the reader of the card does not reveal to the current player, unless the player fulfills it. These cards contain conditions like, "If the current player controls a survivor at the Police Station, read the following:" and the rest of the card has a bit of story, and then a decision. The player (and sometimes all the players) then need to decide on their course of action concerning the story, and deal with any consequences that decision presents. Not a super exciting photo, but I didn't want to spoil anything about these awesome cards!! This mechanism is brilliant. I know reviews can rely on hyperbole a little too often, but really the Crossroads cards are my favorite part of this game. It creates a weight to each player's turn, since she has to go about the things she wants to do, knowing that she might be interrupted at any moment by the player holding the Crossroads card. Not only that, but the Crossroads cards have really interesting story beats that can create some extraordinary moments for the players. I wish I could say more about how much fun we had with these cards, but I really don't want to give anything away. In fact, one of the things I don't like about the game is that the Crossroads deck is limited. Don't get me wrong, Plaid Hat have provided 80 Crossroads cards, which is a lot - and a Crossroads card won't even be triggered each turn. And I'm usually the first to call out people who complain about this sort of stuff - how many times are you really going to play this game, no matter how good it is? Despite all that, (and perhaps because the cards are just so friggin' awesome) just the fact that the deck is limited (whether or not said limit will ever be reached by me) makes me want more cards. I also mentioned how much fun that exposure die is. Well, it can also be painful (which is part of why I love it). Rolling a Bite (meaning instant death) on your first turn can really knock the wind out of you and the group - but having to deal with the consequences of that so early can definitely make things interesting for the right players. Dead of Winter is a great game. There is a lot going on in the game, but not so much to make the game a slog. As the players internalize the rules, the narrative of the story really starts to shine through. The tensions of the individual objectives, the Crossroads cards, the exposure die, and the fact that its a pretty tough cooperative game to begin with all make for a seriously engaging experience. The first time I played Dead of Winter was with my lovely wife, who is a seasoned gamer, and my dad, cousin, and sister - all three of whom have played some of "my games" in the past but need some encouragement to sit down with one that isn't Wits and Wagers or Telestrations. Right after we lost the first game, we started talking about the stories of our survivors, and what we would do differently when we played again. We didn't have to wait long to find out, because we played again the very next day. And after losing a second time, we set it up to play again...twice. We were up playing Dead of Winter well past 2 AM, laughing and dying horrible deaths. Dead of Winter is the very definition of an immersive experience. My cousin, usually a "too cool for school" type, started reading the Crossroads cards in character, and was pushing all of us to do the same. We all started making up stories for our survivors about their motivations and why they always seemed to fail so miserably. Based on those memorable experiences alone, I can't recommend this game highly enough. 8.5/10.